*THIS VERSION IS AD FREE*Start listening and enjoying the WordofGod with Radio Poder Live. Radio Poder Live offers Christianmusic,Christian Preachings and amazing inspirational stories fromrealpeople with real life situations. Listen at home or on the goandstart your day full of blessing while listening Live.RadioPoderLive Benefits:• Listen live to Energetic Morning Shows,Mid-dayTeachings, and Live Social Media request and play.• Listento liveChristian music from Spanish and English artists.• Enjoy thelatesthits from today’s biggest names in Christian music like -JesusAdrian Romero - Christine D'Clario - Marcos Witt - Evan Craft- andmany more• Listen and learn with Christian teachings fromwellknown pastors and evangelists.• Listen to real people whoovercameall odds to come out victorious with Christ.• Listen andinteractwith prayer requests and Christ filled DJ's• Contact thestationdirectly by phone or email with ease.• Visit the stationwith theintegrated Google MapsBe sure to use the donations tab tosend inyour donations to keep the radio and ministry going. Follow,Likeor even Share the app and social media with your friends. 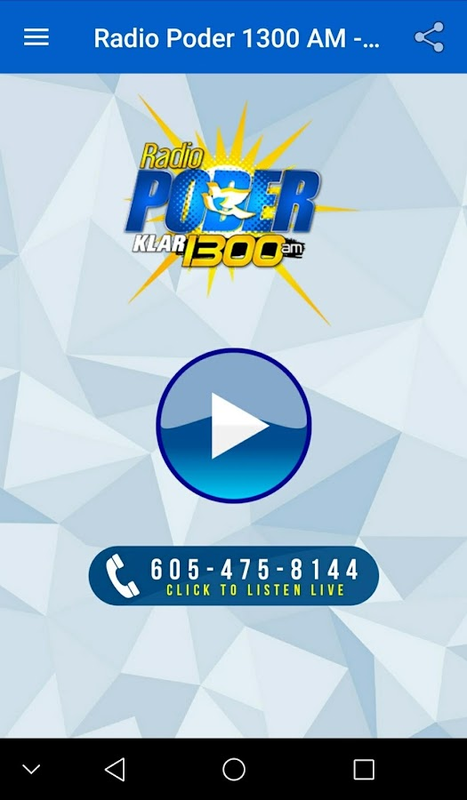 *This version includes ads*Start listening and enjoying the Word ofGod with Radio Poder Live. 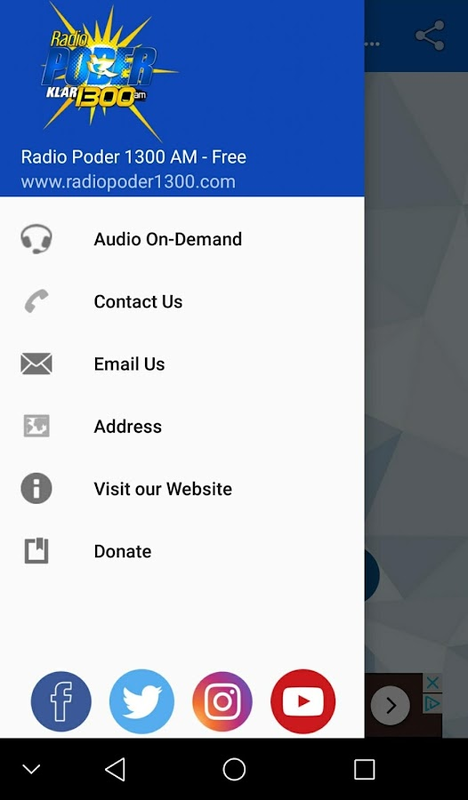 Radio Poder Live offers Christian music,Christian Preachings and amazing inspirational stories from realpeople with real life situations. Listen at home or on the go andstart your day full of blessing while listening Live.Radio PoderLive Benefits:• Listen live to Energetic Morning Shows, Mid-dayTeachings, and Live Social Media request and play.• Listen to liveChristian music from Spanish and English artists.• Enjoy the latesthits from today’s biggest names in Christian music like - JesusAdrian Romero - Christine D'Clario - Marcos Witt - Evan Craft - andmany more• Listen and learn with Christian teachings from wellknown pastors and evangelists.• Listen to real people who overcameall odds to come out victorious with Christ.• Listen and interactwith prayer requests and Christ filled DJ's• Contact the stationdirectly by phone or email with ease.• Visit the station with theintergrated Google MapsBe sure to use the donations tab to send inyour donations to keep the radio and ministry going. Follow, Likeor even Share the app and social media with your friends. RTS Planeta (RTS Planet) is a new multimedia internet service thatenables you to enjoy live broadcasting of television and radioprograms of the Public Service Media Radio Television of Serbia, a72 hour catch-up service (delayed viewing of program content),Video On Demand and Audio On Demand services (the ability tomonitor TV and radio shows within Videoteka (The video library) andSlušaonica (The audio library), as well as individual stories fromthe RTS correspondent network within program Moj grad (My city).Music editions of PGP RTS are available on RTS multimedia platformRTS Planeta. For the monitoring of the RTS Planeta service, theuser must download the RTS Planeta application, provide Internetaccess and the correct operation of the receiving device. Programoffer RTS TV channels - basic package: - RTS 1 - RTS 2 - RTS 3 -RTS HD - RTS SAT - RTS Trezor - RTS Život - RTS Drama - RTS Kolo -RTS Muzika - RTS Poletarac Radio channels: - Radio Beograd 1 -Radio Beograd 2 - Radio Beograd 3 - Beograd 202 Special livebroadcasts: - Sport multi broadcasts - championships, leagues -Concerts and music festivals - Cultural multimedia projects RTSvideo library Since 1958, when the broadcasting of televisionprogram began, archive treasures of national importance are kept inthe TV Belgrade Program Archive. It is a sort of testimony of thecultural milieu, political, social, and other conditions inYugoslavia, Serbia, and the wider European and global context,since the second half of the twentieth century to the present. Fromthe rich TV production of the oldest national broadcasters in theregion, within its VoD service RTS offers the best and most diversecontents of all program genres: current-informative,educational-scientific, cultural-artistic, youth programs,children's, entertainment, music, sports programs, as well as thecult series of RTS. National Cinema Within its National cinema RTSPlaneta brings you memorable films of Yugoslav and Serbian cinema.Among other things, the repertoire will include new, remasteredversions of the most popular films of domestic production. RTSSlušaonica (RTS audio library): One of the oldest radio stations inEurope, Radio Belgrade, in its Slušaonica presents what no one elsehas - from the oldest recordings from Serbia from the third decadeof the 20th century to the unique information, entertainment,music, children's, cultural, scientific and other modern contentsof today. Listen to the voices of Serbian legends, music of thehighest quality, from the first soundtracks to the new recordingsof the legendary Radio Belgrade Studio 6, the cult and awardwinning old and new shows of our four programs: Radio Belgrade 1,Radio Belgrade 2, Radio Belgrade 3 and Belgrade 202. My citySpecial attention in our TV offer is dedicated to stories comingfrom 25 cities across Serbia through the RTS Correspondent Network.Within the VoD service My City, the platform's users have theability to see images of urban and rural life in one place. We givea comprehensive picture of everyday life in Serbia, from cities anddistant places. We talk about the future we strive for and the pastthat teaches us. Through field reports, we monitor the pulse ofSerbia, with information about important events and life problems.We bring first hand news in crisis situations and images that leaveno one indifferent. In their stories RTS reporters preserve thehistory and traditions of entire Serbia. PGP RTS Users of the RTSOTT platform of Radio television of Serbia will have access to PGPmusic editions. The first record with the PGP - RTB sign waspublished in October 1959. It was the first independent record andthe first big hit "Zvizduk u 8" by Đorđe Marjanović. From the firstsingle "Kafu mi draga ispeci", by Cune Gojković, to date, a largenumber of representative and exclusive editions has been issued.